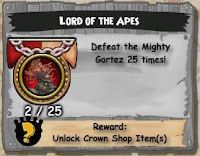 I have been trying to get all the badges in Pirate101, and the only one I have left to get (I think) is "Lord of the Apes." This is the badge that you get for defeating Gortez 25 times. The reward for the badge is also a companion that is unlocked in the Crown Shop, Goronado. Anyway, it should be fun! I am hoping lots of people will come to help. :) You can find the details below. Where: Meet at the Gold Monkey Entrance. Not sure how to get there?